A destination for backpackers and hip travelers, Colombia is known for its vibrant culture and friendly residents. With Medellín attracting those seeking nightly salsa partners, and Cartagena drawing travelers looking for a Caribbean beach getaway, Colombia continues to fascinate travelers and overcome its sordid reputation. Despite its image to some, one reputation that’s well deserved for this country of 46 million is its food. Enter Bogotá, the country’s capital city, teeming with food trucks serving fresh fruit on the streets, hole-in-the-wall panaderias, sprawling farmers’ markets, and gourmet zones attracting loyal clientele. For foodies eager to taste some of the country’s best food, Bogotá is where it’s at. To find the best and cheapest food Bogotá has to offer, travel along La Septima, the city’s major snake-like avenue that runs east to west. On weekends, locals flock to Zona G and Zona T meeting grounds to start off their nights filled with drinks, music and bar fun. On Sundays, Bogotános come out to play during Ciclovia when La Septima — one of the city’s main thoroughfares — closes down to cars and opens up to pedestrians, joggers and cyclists. During the week, students and businessmen alike hit nearby barrios for hearty meals at corner restaurants. No matter what time of day you find yourself roaming around the city’s streets, there is much to intrigue your palette. To get you started, here are seven places to eat like a Bogotáno. It’s my first full day in Bogotá and I’m determined to do some exploring, so Jeff from CareerBreakSecrets.com — a fellow travel blogger I’m staying with — and I flag down a taxi and head to the city center to see where Bogotá comes alive. Surrounding us is orderly chaos: Food carts, merchants shouting out specials, knickknacks being sold for pennies (or super cheap pesos), students out with friends passing along art murals and crumbling graffiti walls, and businessmen loudly chattering over the phone on their way to lunch. We’re ready to eat, and lucky for us we see that Mona’s is fairly empty. As I sit and look around the restaurant, I notice the plates are huge, and I question whether my appetite can handle the portions. 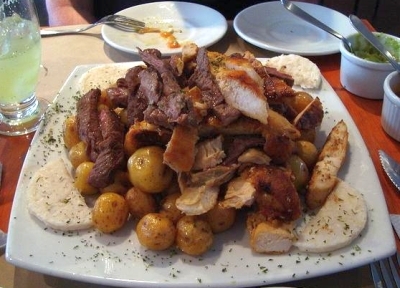 Undeterred, Jeff suggests a typical Bogotáno dish: Pollo y carne a la plancha — a heaping meat platter paired with roasted baby potatoes, patacones (flattened fried plantains), and everyone’s favorite, arepas. “This is lunch?” I ask the waiter. One of the things I love to do while traveling is to wake up early with the city. Bogotá has its own morning routines, as small bakeshops and cafes cater to commuters starting their day around 8 a.m. Lucky for me, I found a few neighborhood spots nearby to get my morning fix: Cafe con leche and a pastry — usually a croissant filled with local cheese. 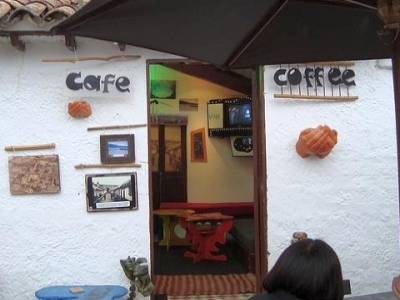 Bogotános tent to order coffee as tinto (a small cup of coffee) or espresso, but I choose to take things easy. Here at Pan Fino, coffee is served in a small styrofoam cup and runs only 1,200 Colombian pesos (about 75 cents). It becomes a must every morning as I head out for the day. In many parts of the world brunch is a cherished weekend tradition, and in Bogotá it’s no different. The same weekend I arrived, the Sunday paper ran an article called, “The Top 5 Places to Brunch in the City” — what perfect timing. So I skimmed through for the nearest recommendation, and Brot Cafe stood out for its chocolate baguette. I head out to see if it lives up to the hype. Located on a posh street in Zona Rosa, Brot Cafe is an intimately casual, Parisian-like cafe with wonderfully simple breakfast options. 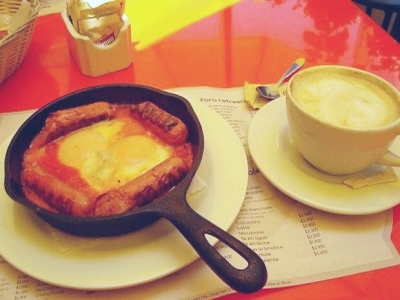 I order the huevos rancheros — a dish I grew to love over my trip — which includes soft scrambled eggs with ham and cheese served in its own skillet and topped with two sausage links cooked in a rich red salsa. Cafe con leche follows, as I’ve learned drinks are often not served first before your meal. All this and the total comes out to only 7,000 Colombian pesos (USD$3.50). Like many other metropolises, Bogotá is a city populated by regional migrants, which helps explain what makes it such a distinct food city. Its large community of expats consists mostly of those from other Latin American countries, which can be best seen when roaming the blocks near La Septima. With this in mind, I decide to give Bogotá’s international influence a try and head to L’Arca, a cevicheria, for dinner with friends. A seafood restaurant, it was highly recommended for its ceviche and coconut rice, though my shellfish allergy steered me to the tilapia entree instead. My choice paid off, as the filet was perfectly cooked — softly seared — and the coconut rice, a first for me, was light and fluffy, and its tropical flavors were subtly infused in the grains. The meal was a fresh change from the heavier meals I was growing accustomed to here in the city. Evenings come quick in Bogotá, and when it does, the city starts to slow down. It’s hard not to join in the silence of the night, but there are some cozy spots that make for great nightcaps, such is the case with Casa 53*76, an eclectic music cafe where vinyl records decorate the walls and students sip lattes gathered around small tables outside. The cafe is manned by a lone barista who tends to the smokers and coffee sippers as he mazes in and out of the cafe patio. A magazine and small coffee is all I need to relax and take in the scenery. Bogotános are known to escape the city and retreat to their fincas (country homes) on the weekends. In my effort to live like a Bogotáno, I joined some friends for a day trip outside of the city to explore the country’s colonial past, and head to Zipaquirá and its main attraction, an underground cathedral created in a former salt mine. Zipaquirá welcomes travelers with guided tours, photo-ops and a charming square. 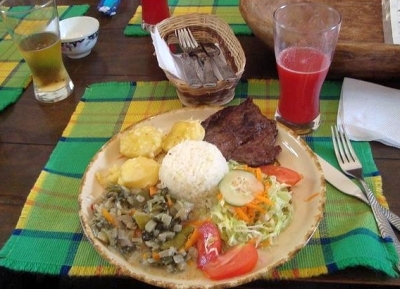 Inside Fundacion Casa del Chorro, a hotel located near Plaza de la Independencia, is Habra Camilona, an inviting restaurant that serves plates of traditional homemade regional dishes at popular prices. Lunch specials run the gamut as husband and wife are eager to share their recipes with visitors. At only 6,000 pesos, we took advantage of the hefty plate of thinly-grilled steak with stewed vegetables and potatoes, cole slaw, and rice accompanied by freshly squeezed blackberry juice. Truly an unbeatable atmosphere at an unbeatable price. Anyone who has gone knows, Andres Carne de Res is an experience, or so I’m told. Not just a restaurant or a club, but a wild nightlife destination for Bogotános. But this isn’t the Andres in the town of Chia — which requires a 30-minute drive out of Bogotá — but rather the Zona T location, a convenient alternative, especially for those looking for a quiet breakfast. Though a nightclub by night, during the day this mall restaurant opens up to shoppers. I swung by for a vegetable omelette and jugo de fresa (fruit juice) and was pleasantly surprised. Who knew mall food could be so good? Turns out, when talking about eating out in Bogotá, surprises are around every corner. Alisha Miranda is a certified Travel Geek. She’s turned Tumblr into her new travel musings’ journal, is creating personalized trip itineraries at Bright Lights NYC, and blogging about Brooklyn at Neighborhoodr. She’s currently saving her pennies for a digital nomad kind of life in Uruguay next winter.